LRWP founder Heather Fenyk currently serves on the LRWP Board and as the LRWP’s de facto Executive Director. Jon Dugan hails from Bound Brook, New Jersey; born and raised on the banks of the Raritan River. 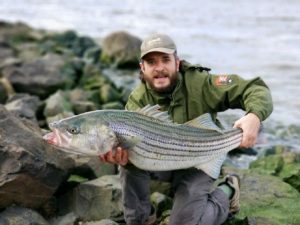 Jon has worked with the National Park Service as a Park Ranger, Americorps as a Watershed Ambassador, and many environmental associations within New Jersey. He has led community-based projects, presented to diverse groups, and is most proud of his Roving Naturalist spontaneous education series of programs. In his free time Jon can be found fishing, gardening, lifting, kayaking, hiking, or tying flies. Jon will be working as LRWP’s Volunteer Monitoring Manager in creating our Quality Assurance Project Plans for water monitoring within the Raritan River watershed. Jillian is conducting analysis of historic water quality data for inclusion in a “State of the Lower Raritan Watershed Report.” She is a graduate student in Landscape Architecture at Rutgers. Daryl earned a BS in environmental planning with an emphasis in geomatics at Rutgers University where he continues to work as a GIS analyst at the Center for Remote Sensing and Spatial Analysis. His work is focused on the impact land use and land change has on watershed health in the Raritan Basin. Bill is a retired Captain & shift commander in a career fire service, hazardous materials technician and instructor in water rescue. Schultz has served with various underwater search and recovery teams. In 1991 Bill Schultz began his work as an environmentalist as a volunteer water quality monitor for the NY/NJ Baykeeper. He started the Baykeeper Boat Auxiliary in 1993 and established the Raritan Riverkeeper program in 1999. Atanas is the founder and principal of EntchevDotCom, LLC — a GIS and web development consultancy based in New Brunswick, New Jersey. Atanas received an MS in urban planning from Rutgers University. He built his first website in 1995, writing raw HTML by hand. Johnny is helping the LRWP spearhead our pollinators garden project for the City of New Brunswick. Johnny currently serves as a program coordinator for The Collaborative Center for Community-Based Research & Service at Rutgers University. In this role, he helps to develop and facilitate community-based research projects, as well as community-based GIS mapping projects. Prior to working with The Collaborative, he served as an AmeriCorps VISTA based in New Brunswick, New Jersey for one a one-year term. Johnny holds a B.A. in Planning Public Policy and Geography from Rutgers University.